Famously, the new National Health Service of 1948 provided the British people with free spectacles and dentures according to need. The huge demand that ensued has come to be seen as a symbol of the transformative nature of the new service. Less well known is that the NHS also set about providing free wigs. It is interesting that these wigs, unlike the glasses and the dentures, have been largely forgotten. At the time, they attracted a huge amount of attention. They provided a perfect target for comedy in the press, cartoons, and music halls. Even Bevan, who was keen to defend the provision of free wigs, found it difficult to resist the humour of the subject, as he chose to point out that he of course had no vested interest (unlike much of the rest of the front bench). The commentators surely had the Minister of Health’s luxuriant mop of hair in mind when they began to describe the NHS hairpieces as ‘Bevan Wigs’. For the critics, the wigs epitomised the dangers of NHS spending getting out of control. 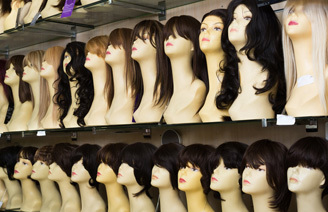 The Daily Mail predicted a deluge of demand from people keen to exploit state benevolence, and it grumbled at the idea that everyone would be given not just one wig but two (though this was necessary as wigs had to be regularly cleaned and dressed – another cost which would now be covered by the NHS). Hospitals were reportedly flooded with leaflets from wig-makers eager for contracts to produce a range of styles at up to £18 per piece. For the critics, this was all a huge extravagance at a time of ongoing economic crisis: the country needed ‘frigates not free wigs’; and it would not be long before the Americans began to complain that their economic aid was being squandered on ‘toupees for the British’. Wigs were less easy to justify than the glasses which were necessary for clear sight, or the dentures that were needed for eating. And as the nation looked to get back to work, there was an economic argument to help legitimate free provision of items such as surgical boots and abdominal belts. Wigs, by contrast, had to overcome sniggers of embarrassment, and the sense of being frivolous, vain, and even unmanly. But wigs were also there on the select list of free services because of real and often desperate need. Although the jokes in parliament and in cartoons focused on the easy target of unmanly vanity, it was women who were the prime focus of provision. This was not an issue of fashion (indeed, the move to short hair after the First World War had seen a collapse in that market). Wigs were to cover up a flaw, not to flaunt. Advertising was therefore discrete, and it went alongside a booming market for hair-restoring and baldness-preventing shampoos and tonics, marketed at women as well as men. The demand for free wigs in 1948 should be attributed to this culture, not to fashion. It also reflected the fact that these were expensive items, still handmade, depending on a limited supply of human hair, and having a limited lifespan. Parliament was told of one woman who had gone as far as committing suicide as a result hair loss. Jennie Lee, the Labour MP and wife of Bevan, reminded those who mocked the free wigs of the horrific shaving of the heads of female collaborators by Britain’s allies at the end of the war: if any evidence of how shaming and humiliating hair loss could be, surely this was it. Despite efforts to defend wigs as an essential need, a prescription charge was introduced in 1952 (at £2 10s, about an eighth of the total cost).This calmed the controversy, but it resurfaced as wigs took off again as a fashion item in the 1960s. By the end of the decade, it was being claimed that provision and maintenance of wigs was costing the NHS an eye-catching £1 million per year. It was suggested that a major contributing factor was the feeling among an ageing population of women that it was their right to get a wig from the NHS to address thinning hair. Strictly speaking, wigs were only supposed to be prescribed for people who lost their hair through the result of illness or accident, or who suffered from a congenital problem, but hospitals found it difficult to turn down requests when obvious psychological need was a factor. Once again, even the medical press, struggled to resist making fun of the subject, talking of the folly of focusing medicine on ‘wigiatrics’ while cutting back on things like x-ray services. The emergence of new cheaper nylon and acrylic wigs, which had been a factor in the new fashion, was now suggested as a possible solution to the issue of cost, but this overlooked the fact that the purpose of the NHS wig was to cover up hair loss and thus hide not proclaim its identity. By the start of the twenty-first century, the NHS had entered an era in which the patients’ views had to be taken into account. Here, the sensitivities around an object such as the wig, overlooked in an era dominated by the voices of politicians, newspapers, and doctors, are revealed far more clearly in the records. What also becomes apparent, however, is the dissatisfaction with the standard NHS wigs. Instead, patients wanted to be able to use the prescription to assist with the purchase of a wig that would more adequately address psychological needs arising from the distress of losing hair. But a more fundamental shift was that wigs would be free only for those who qualified for help: inpatients, children, those on benefits, or war pensioners. For others, wigs would be available through the NHS, but at a charge, which recently stood at £271.70 for a full bespoke human hair wig. BBC presenter Victorian Derbyshire was still breaking a kind of silence when she spoke openly about her feelings in losing hair after chemotherapy for breast cancer in 2015. The wig that she wore until a public reveal on video in 2017 was vitally important. It helped her ‘get on with things, go to work, live my life normally without worrying’. Indeed, she described losing her hair as one of the most upsetting aspects of the illness, more so even than the mastectomy. But equally revealing is her remark about admitting this: ‘don’t judge me for that, it’s just the way I felt’. It’s a remark that reminds us that wigs could be a necessity, not an accessory. This was something that the NHS, rather remarkably, had recognised and acted upon in 1948. The NHS wig therefore emerges as an intriguing object in thinking about changes, continuities, and tensions in the moral economy of free provision under the NHS. The disappearance of the free wig from our popular understanding of the history of the NHS tells a story of its own. We need help now in further uncovering this history. We would welcome your reflections and personal stories. We also want to recover a lost material culture. And can you help us with a question: where have all those ‘Bevan wigs’ gone? Would the people’s history of NHS archive like my research project part of my MCIPS diploma course? Or I could write a précis for your site? Hi, thank you so much for getting in touch! We would absolutely love to hear more about this process – we’ve been keen to know more about wigs and unable to find many archival materials. If you are happy to write a piece for us summarising your findings in this area, we would absolutely love to publish it, thank you so much! Please email me (Jenny) at J.Crane.1@warwick.ac.uk to send it over or if you want to discuss more! Looking forward to it!